Jumping Castle suitable for the kids 3 to 7 years old. The Bouncy Train is one of our all time favourites because it looks great and there's plenty of variety to keep the kids amused. The tunnel entrance leads to space for up to 4 children to bounce at once. At the back of the train there is a small climb up to a great slide exit. Another original jumping castle design by Happy Hop ideal for children aged 3-7 years. 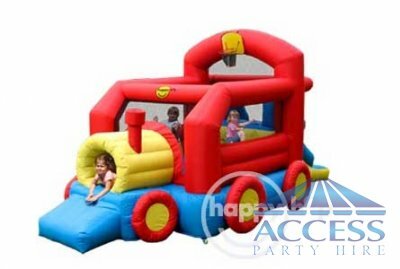 Now you can hire Train Jumping Castle for only $170.00 over the weekend !! !